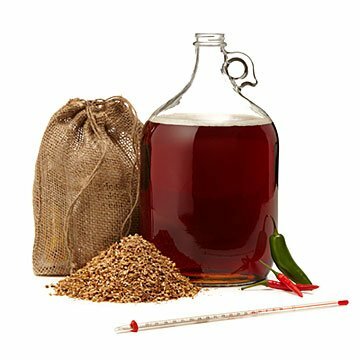 Brew your own amber ale with a hint of smoke and a spicy chipotle kick with this premium beer brewing kit. These boldly designed, premium brewing kits use 100% malt extract, world-class specialty grains, fresh hops, and high quality yeast: that's everything you'll need to create the kind of pints you'll have no problem polishing off. Plus, this mild amber ale possesses a strong malt profile and a touch of smokey hotness from the chipotle pepper included in every kit. Assembled in Orlando, Florida with US-grown ingredients. This is priced perfectly for a first time brewer, comes with everything they need, and made a great gift. My boyfriend is so excited to use it! I got this gift for my boyfriend because he's brewed his own beer before and wanted to brew more but didn't like the Mr. Beer products and he couldn't really find any other good brands to use for a brewing kit. I got him this one and it has absolutely everything he needs and he loves that he knows where all the ingredients come from! My son lives in Austin, TX and had mentioned he would like to try pairing beer and wine with food. He is is wonderful cook and I thought this would be a great new hobby for him because he is so creative. He was so excited to get this for his birthday and has already started a batch. This is Texas in a bottle! Not a big head, but, awesome deep flavor. This ale is rich ....smoky....with a nice light chipotle finish. I was shocked at the results I got. Gave this to my brother for his birthday and he loved it! Very simple instructions and turned out some tasty beer. I would buy this product again! LOVE IT!! We haven't gotten to make the beer yet, but it came on time and we are super excited to try it out! I've heard nothing but good things about this sight, and will definitely order from here again! Got this for my Husband bday gift. He loves to brew his own beers and trying to find something different is hard. But he seemed to like it and he can't wait to try it out. My husband was Unbeeeerably happy! I really was pleased with the product. It made my husband very happy.. This beer-brewing kit was a great project to do with friends (and I do recommend having at least one other person around to help out). It comes with great quality ingredients and clear instructions. We will almost certainly be buying a another kit to try it again. Dad loves it. Came with every last piece he needed and has been very happy. So happy he is ordering more now!